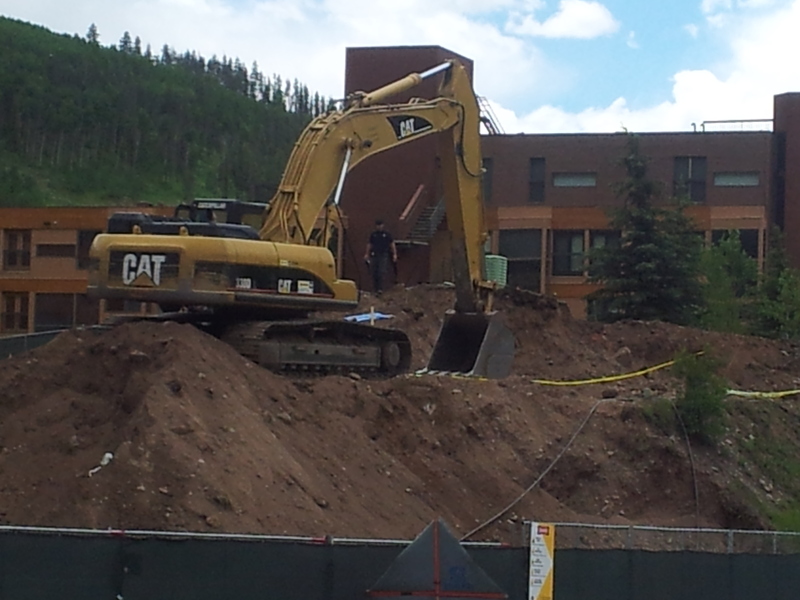 An investigator on Friday combs through the northwest corner of a condo redevelopment in Vail’s Lionshead area where skeletal remains were unearthed this week (David O. Williams photo). Following the discovery of skeletal remains last week, a Vail police detective this week said there’s only one active, adult missing-person case in the ski town of more than 5,000 residents: Julie Cunningham, a victim of serial killer Ted Bundy in March of 1975. But Detective Sgt. Annette Dopplick said it’s too early to know if the human skeleton unearthed during a hotel demolition project last week is the 26-year-old ski instructor and ski-shop worker whom Bundy said he kidnapped, strangled, dumped near Rifle and later returned to bury. Pressed on whether the Cunningham case file, including any dental records, is a focus of the investigation, Dopplick said, “The case manager for the skeletal remains is familiar with the Cunningham case and … will be keeping it in mind.” But Dopplick would not comment on whether the file, which she said is actually a large box, contains Cunningham’s dental records. “It is an active investigation, which means we don’t usually comment on what it may or may not contain,” Dopplick said. Retired Vail Police Detective Matt Lindvall, who interrogated Bundy about the Cunningham case on death row in Florida in 1989, said last week that her dental records were still in the files in Vail when he left the department in 2005. “Do I think it’s Julie Cunningham? That wasn’t the location that was given to us in confessions in 1989, but her remains have not been discovered,” said Lindvall, who knew Cunningham and lived in the same condo complex prior to joining the police force in 1979. “I’d be surprised if those remains are from Julie Cunningham, but I would hope that if it is, it gives some rest to her family,” said Lindvall, who added Bundy told him he dumped her body near Rifle about 90 miles west of Vail along Interstate 70 then returned the next month and buried her. Multiple searches failed to turn up any sign of Cunningham’s remains. Eagle County Coroner Kara Bettis said about 70 percent of the skeleton first found last week has been recovered using cadaver dogs over the weekend, including a partial skull and a nearly full set of teeth. She said bones were recovered at both the Vail construction site – where a new hotel is being built – and a debris disposal site in Edwards. Bettis hopes to know the gender of the skeleton and the person’s age when they died within a couple of days. A positive identification might take much longer, she said, declining to discuss any specific timeframe revealed by preliminary testing. Bettis said all of the bones have been transported to Grand Junction and are being examined by forensic specialists. The two hotels torn down on the site were both built in 1973, two years prior to Cunningham’s disappearance, but the skeleton was traced back to a utility easement along a frontage road that dates to 1967 and was not beneath either building footprint. The town was first incorporated in 1966, and the ski area first opened in December of 1962. Prior to that, the Gore Creek Valley was a summer hunting ground for Ute Indians and later home to sheep herders and lettuce growers before becoming a posh international ski resort. Bundy — executed in the electric chair in Florida in 1989 after murdering at least 36 women — was a law student at the University of Utah in 1975 when he killed several Colorado women, including Denise Oliverson in Grand Junction and Caryn Campbell in Snowmass near Aspen.